Through social media alone, we have many choices of whom to follow: actors, athletes, politicians, reporters, and so on. We can choose to receive up-to-the-minute news on their thoughts, opinions, hopes and plans. We can tell the world we liked what we read and even share it with the click of a mouse. But are we sure we want to model our life and work on those of another person? Are we sure we want to follow that person’s example? At some point, we all have to choose the path we’ll follow. We might admire others’ way of life, their good works, their values, but only Jesus has “the words of eternal life.” As Peter preached to the Council in Jerusalem, “there is salvation in no one else, for there is no other name under heaven given among men by which we must be saved” (Acts 4:12). Just as Joshua (see Joshua 24:14-28) and the prophet Elijah (see 1 Kings 18:20-40) asked the Israelites to choose whom they would follow, we have a choice to make: we can follow the path others have taken, or we can follow God and ask him to guide us in the way that we should go. As we prepare our hearts during the season of Lent, I pray that we would commit ourselves once more to following the Lord. By charity, we love God above all things and our neighbour as ourselves for love of God. Charity, the form of all the virtues, ‘binds everything together in perfect harmony’ (Col 3:14). This morning, the wonderful aroma of banana muffins filled my kitchen. I whipped up a couple of batches for a bake sale at my son’s school to raise funds for Typhoon Haiyan relief. As well as supporting fundraising efforts by purchasing treats at the bake sale, students could earn admission to a Friday afternoon movie in the gym by donating to the cause. And one teacher promised to grow out his hair if donations reached a certain level, while another vowed to match donations up to a set amount. Sure, all this is good for school spirit, which suffered during last year’s contract negotiations. But above all, it’s a good example of what the Spirit can do. We’re approaching the Christmas shopping season, and the reminders are everywhere: flyers featuring seasonal items and “perfect” gifts, holiday songs on the radio and holiday movies on TV, Christmas decorations gradually appearing in stores. Even young people past the age of belief in Santa might begin thinking about their wish lists now. And yet students and teachers took time out to put together this week’s activities to benefit others. If I could judge by the groaning bake sale tables (and apparently there were more on the second floor of the school), the school community strongly supported their efforts with their time, treasure and talents. I pray that we would encourage our children and youth as they try to serve others and that we would thank those who model for them how to serve. I know that sending less paper mail is good for the environment, but I admit that I enjoy receiving cards in the mail with handwritten messages, and I remember eagerly waiting for letters from my Australian pen pal to arrive. I also enjoy making greeting cards and hope people enjoy receiving them because of the love and time I put into them. From mid-May to mid-June, there are lots of occasions to celebrate in my family: Mother’s Day and Father’s Day, several anniversaries and half a dozen birthdays. And so I find myself sending out a lot of cards. As I write messages of good wishes, I see that my handwriting is not as neat as it once was. I notice the same thing when I write cheques or sign forms. And my son and his classmates seem to print more than they use cursive writing. Handwriting is becoming a lost art. But something I hope will not become a lost art is the handing down of our faith to the next generation. I’m happy to say my parish often has baptisms, and we’ve had new people join through RCIA over the past couple of years (including me). There are plenty of children in church and many celebrated First Eucharist this year. And our Catholic Women’s League membership is growing. I know, though, that other parishes aren’t so fortunate and see their numbers dwindling. With my parents’ generation and my own, church attendance has fallen. Is it the faster pace of life or a belief that we don’t need to have faith? Have people moved away from the Church because of scandals or the lure of spiritual movements? I could only guess. For my great-grandparents’ and grandparents’ generations, faith and involvement in parish activities were part of life. 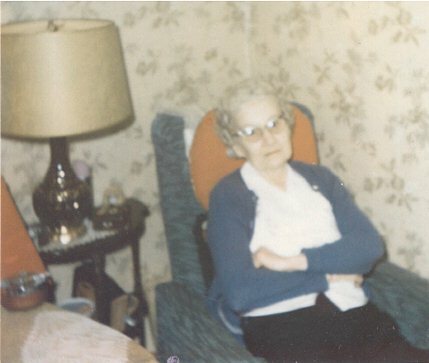 Even though Nan was a shut-in, she still watched church services on her black-and-white TV. She would send me Christian greeting cards and write things like “God bless you” in her shaky handwriting. And Nanny was actively involved in her parish over the years, teaching Sunday school, singing in the choir and helping with activities run by the ladies’ auxiliary. While we do need to have our own faith since no one can have faith for us, it certainly helps to have good examples of how to live in the faith—family and friends who model how a Christian should live and who share their faith story with us. I think of the apostle Paul’s comment to Timothy in 2 Timothy 1:5: “I am reminded of your sincere faith, a faith that dwelt first in your grandmother Lois and your mother Eunice and now, I am sure, dwells in you” (Holy Bible, Revised Standard Version, Second Catholic Edition). Trying to live out our faith doesn’t guarantee our families will share that faith. Many families these days include non-practising Christians, agnostics, and even some who claim to be atheists. In the Bible, the books of 1 and 2 Kings give us examples of children who didn’t follow in their fathers’ faithful footsteps. But these same books also give examples of children who came to faith in spite of the things their parents had done, and the book of Acts shows us that living in faith can help us lead others to Christ. I pray that, by the way we live and the way we explain the reasons for our faith, we would draw our family members and others (back) to the Church.